I’ve been sharing my thoughts on saving money and frugality for nearly 8 years, and in that time I’ve read (and written) quite a few blog posts on frugal fails. These #frugalfail stories usually involve writers reprimanding themselves for things like eating out too much, soda addictions, not using coupons, impulse buys, paying for services or conveniences, refusing to cut the cord, taking vacations, and the like. They are often riddled with rationales for why they spent the money on what they did or why they didn’t save. They need to stop because we don’t need to answer to anyone but ourselves. We don’t owe anyone an explanation as to why a self-proclaimed cheapskate would buy cases of Diet Coke when water would be better for the wallet and kidneys. We don’t need to apologize for not clipping coupons or paying someone to fix our plumbing. We all spend money differently and we all have the right to decide how to spend our money. We all make mistakes from time to time because we are human. It’s okay to splurge in some areas of your life when you economize in others. In fact, that’s what makes saving money fun. If all we ever did was pinch pennies, life wouldn’t be very enjoyable. You’ve got to budget some money to blow. These “frugal fails” that we talk about are just the means to an end. They do not mean that we are not frugal people. These are just some things that can dictate how quickly we move on the path toward reaching our financial goals. The real way to be a frugal failure is to be so focused on all of the little things we’re doing (or not doing) to save money that we lose sight of the big picture. The real way to be a frugal failure is failing to plan for a secure financial future. Real Frugal Failure #1: Failing to save for retirement. According to a new report released by Financial Finesse, Fewer than 1 in 5 employees are confident they are on track to meet their retirement goals. Of those that are not on track, over 75% of them have never even run a retirement calculator, and only 47% have taken a risk tolerance assessment to determine how they should invest for retirement. A big retirement crisis is looming for the 76 million Baby Boomers nearing retirement age. According to the National Institute on Retirement Security, the median retirement account balance among households ages 55-64 is only $14,500. That’s only enough money to cover living expenses for a few months! These are frightening statistics. If you are not saving for retirement, you will not be able to retire. Period. Money may be tight right now, but simply cannot afford to not save for retirement. I have heard from folks who tell me that they don’t worry about it because they’ll have Social Security. Or they’ll “keep working” until they’re dead. They believe someone will step in and take care of them. But the reality is that with a huge population of unprepared Baby Boomers retiring, there isn’t enough money to do that. Some of these folks may not be healthy enough to continue to work. These are folks who live in the moment and buy what they want now. And if they’re unable to save money now, how on earth are they going to be able to afford to live on a fraction of their income in retirement? You may also be costing yourself thousands of dollars in missed benefits if you are not taking full advantage of your employer’s retirement plan. That is a real frugal fail. You absolutely must start saving for your future today so that your money has time to grow. Even if it’s just a small amount. You have to start now. Real Frugal Failure #2: Carrying massive amounts of debt. It doesn’t matter how you got into debt – student loans, car loans, mortgages, credit card debt – if you are carrying debt you are wasting thousands of dollars on interest fees. You have traded financial freedom for having it all when you wanted it, and that will cost you dearly. It will cause you pain, stress, and financial hardship until you get rid of that debt and learn to stay out of debt. The best thing you can do to create a successful financial future is to learn to live within your means. Real Frugal Failure #3: Failure to have an emergency fund or savings of any kind. A credit card is not an emergency fund. A relative willing to give you some cash when your car breaks down is not an emergency fund. You will never stop living paycheck-to-paycheck unless you start setting aside some money in an emergency fund. An emergency fund is your insurance policy against the unexpected. Without one, you can expect your dreams to be derailed. Start small, and work on building that emergency fund now. Real Frugal Failure #4: Placing our children’s priorities ahead of our own. We all want what’s best for our kids. We want them to have it better than we had it. But we simply cannot sacrifice our futures for the sake of theirs. Children learn from adversity. They learn from the experience of making sacrifices and making do with the resources they have. A child who lives at the center of the family will be the child who never has a reason to leave home and go out on his own. You are not a failure as a parent if you haven’t signed on for expensive preschools, music lessons, sports camps, and colleges. Your child is not a failure for a lack of those things. You must take care of yourself and your spouse first. You must make your financial security the priority above all else. There are no loans for day-to-day living or retirement. Your children will not be able to afford to support you. You must take care of yourself by getting out of debt, building an emergency fund and saving for retirement. Only then can you consider helping your children with their financial needs. Real Frugal Failure #5: Pretending everything is fine when it’s not. Stop worrying about what other people think. Forget about keeping up appearances. It’s time to get real. If you are struggling financially, it’s time to come clean with yourself and your loved ones. It’s time to start making some plans to change. Pretending everything is fine and that your problems will go away on their own only make your situation worse. Real Frugal Failure #6: Failing to learn from past mistakes. It’s okay to make mistakes. It’s not okay to ignore the lessons from those mistakes. When you make a money mistake – big or small – reflect on how you made that mistake. Consider the emotions that led to the mistake and then think about what you can do to prevent it from happening again. True financial growth comes when we learn grow from our mistakes. The little things we do to save money add up. This is the money that we use to make the big changes happen. 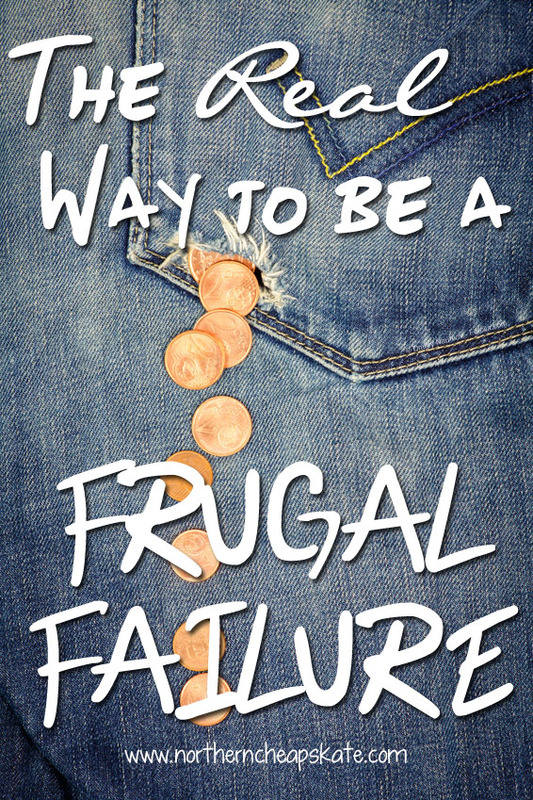 Those little frugal fails we read and hear about happen from time to time, and that’s okay. It’s only when we let them turn into the real frugal failures that there is trouble. If you can honestly say that you are actively paying down debt, building an emergency fund and saving for retirement, then it doesn’t matter if you forgot your coupons this week. And if you’re not reaching those big picture goals, you need to figure out why. Once you determine why you’re not reaching your goals, you can work on how to change your path. Turning frugal failures into success starts with you working to change. Thank you for putting this out there! It’s so true…we really have to look big picture! We need to stop being so hard on ourselves and others for the small things. We all make choices. Some may question my Dr Pepper habit, but do they know I don’t have a normal American cable bill? They may see me with Starbucks sometimes, but do they know I ONLY buy Starbucks when I have a gift card? Can they judge me for my drink choices if they don’t have retirement set up or are carrying loads of debt? Our choices are ours, and we should be more hard on ourselves for the big ones! One of the most frustrating examples I’ve seen is people who set a target and think that’s the absolute end once they hit the target. They’ll vow to get out of credit card debt, and actually do it, then once they’ve done it, they start spending and get themselves right back into the same situation again. Seeing someone make a mistake is understandable, but seeing them repeat the same mistake is downright exasperating! Excellent points. I know I need to be nicer to myself. Abstractly, I know what we’re doing (mostly) makes sense. But it’s disheartening to look at our income and then look at what’s going into savings. But you’re right: We’re accountable only to ourselves — and definitely to our future selves. While I agree that carrying debt means you are paying lots of dollars in interest, I think the second sentence, “You have traded financial freedom for having it all” is not necessarily true. My husband and I racked up debt due to needing to use credit to live on when he was unemployed in his field for over 1 1/2 years. Yes, we HAD over six months emergency fund and other savings and yes, we used it all before we started to go into debt. We’d already cut all elective expenses; we drive cars with close to 300,000 miles on them (NOT a typo) and carry only the state-mandated liability insurance; our kids pay their own college expenses and both work more than one job; selling the house to downsize wasn’t a realistic option in our area with 7 houses for sale just in our small neighborhood alone and we’d never have been able to find a place to rent for less than our mortgage anyway, etc. So tell me how our debt reflects that we “traded financial freedom for having it all when you wanted it”? Not everyone who carries debt on a credit card was busy purchasing electronic toys and expensive vacations…. You are right. When I was writing this post, I had a particular person in mind… a person who lives for today and does not think about tomorrow. Obviously, I failed to consider those who may have been in a situation like yours. I also failed to consider those who may have accumulated debt because of medical expenses or an unforeseen disaster (like a house fire or tornado). But I still feel that my statement does apply to thousands of other folks.. folks who spend now and figure out how to pay for things later, and my tough love was directed at them.